Now with a full 3-D remake, FINAL FANTASY IV: THE AFTER YEARS can be played as never before on PC. Take part in the epic sequel that unfolds nearly two decades after the events of FINAL FANTASY IV. Classic characters make their return alongside several new heroes, such as Ceodore, son of Cecil and Rosa. Begin your journey with ""Ceodore's Tale."" Complete it to unlock the tales of six additional characters, which can be played in any order, and then return to the core story with ""Kain's Tale,"" ""The Lunarian's Tale,"" and ""The Crystals."" A total of ten tales in all, and all contained in FINAL FANTASY IV: THE AFTER YEARS. Take control of exhilarating combat made possible by the non-stop action in Square Enix's iconic battle system. Feel the moon's presence in combat, as its waxing and waning influences the potency of attacks and abilities of all combatants. Lunar phases cycle naturally with the passage of in-game time, or when resting at an inn, tent, or cottage. Combine the strength of your party members to awesome effect with Band abilities that can be unlocked through in-game events or by levelling your characters' Affinity. Keep an eye on your current location and nearby surroundings, or click for quick access to the world map. Includes STEAM Trading cards and achievements! © 2008, 2015 SQUARE ENIX CO.,LTD. All Rights Reserved. 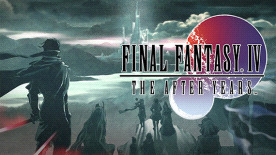 THE AFTER YEARS is a registered trademark or trademark of Square Enix Co., Ltd. FINAL FANTASY, SQUARE ENIX and the SQUARE ENIX logo are registered trademarks or trademarks of Square Enix Holdings Co., Ltd.